It is becoming clear to anyone who cares about the truth that Trump is the least of America’s worries when it comes to government corruption and collusion with the Russians. Sadly, it is also clear that the national media is in cahoots with the left, (and their pals the Russians, apparently). Because instead of telling the truth about corrupt FBI agent Andrew McCabe, the media is telling the nation lies and pretending that this is all Trump’s fault. There has been no better summation about this situation than what nationally syndicated conservative radio host Mark Levin gave in a recent visit to the Sean Hannity show on Fox News. Levin had it all exactly right when he appeared on Sean’s show when he was invited on to speak about the firing of the disgraceful FBI agent. Levin correctly noted that McCabe is not in the least bit a put-upon civil servant like the media wants us to believe, and if anyone wants to see collusion with the Russians, all they have to do is look at Barrack Obama and his corrupt regime. Levin also blasted Lindsey Graham and Marco Rubio for crying about the McCabe losing his pension when he isn’t going to lose much of anything. The best selling author also scorched Comey, McCabe, Samantha Power, Clapper, Brennan and Susan Rice during his visit to Fox News. After Sean introduced him, Levin didn’t need anything else to wind him up on the topic. 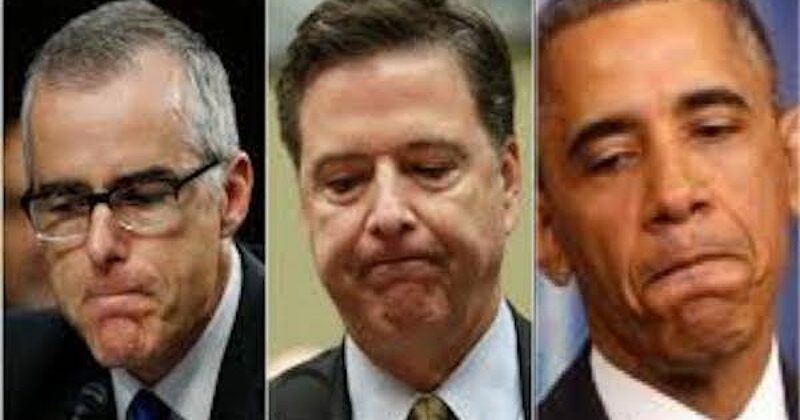 Levin also noted that the newest FBI director put McCabe “on suspension forever.” And this meant, Levin said, that all these people in power, some of them appointed by Obama, all of them agreed that McCabe was a bad cop who should be fired. McCabe is a “bad cop who authorized leaks and then apparently lied about it to the IG and OPR,” Levin insisted. Levin then slammed the media and the liberal Republicans like Sen. Lindsey Graham who have expressed all this cloying “concern” over this scumbag, McCabe. Here’s what’s stunning. You have a media in this country, a Democrat Party, and even some Republicans like Lindsey Graham and Marco Rubio, who are very concerned for this man, that he might lose his pension. He’s not going to lose his pension. Whatever money he put into his pension he gets, it’s just that you and me and Mr. and Mrs. taxpayer don’t have to contribute to his pension for the rest of his life. Why are we supposed to be concerned about this? This man may have committed crimes. He should be in front of a federal grand jury. The problem is, we don’t have a federal grand jury to investigate him or Comey. Now Comey is like the mob boss of the operation. All this was happening under him. Strzok, Page, him, all the rest of it. And Comey’s a known leaker. He confessed because he didn’t want to commit perjury. And now he’s caught with his former deputy who said “yes, everything I did, Comey knew,” and Comey testified he didn’t. These are bad people who did bad things and we expect the head of the FBI and the deputy head to do the right thing, but they’re bad cops. Levin then went on with a brief outline of the crimes and corruption of several of Obama’s other criminal operatives. On Eric Holder, Obama’s corrupt U.S. Attorney General: “Holder repeatedly lied about his knowledge when it came to ‘Fast and Furious.’ The only Attorney General in American history to be held in contempt. He targeted journalists at the Associated Press and at Fox. He refused to investigate abuses at the IRS. He was involved in the pardon of Marc Rich. Even the DOJ IG at some point testified that senior officials under Holder were blocking access to documents. Levin also pointed out that the real colluder with Russia was Obama. Levin began wrapping up his comments by focusing on the fake “Russia” investigation being foisted on the nation by special counsel Robert Mueller. If Mueller is all worried about Russian collusion, Levin said, why doesn’t he haul Hillary Clinton into offices? Or why hasn’t he tagged the head of the Democrat National Committee? Or those other people associated with the fake Trump “dossier” that the Democrat Party bought and paid for to destroy Trump? “Why isn’t he dragging his friend James Comey in front of the grand jury, he had to sign off on the FISA Application. Or Mr. McCabe, or Rosenstein, of Loretta Lynch?”Levin added. This is why they call Mark Levin the “Great One.” He is right on every count. Mueller is not interested in investigating anything to do with Russia. His only job is to destroy Trump at all costs.